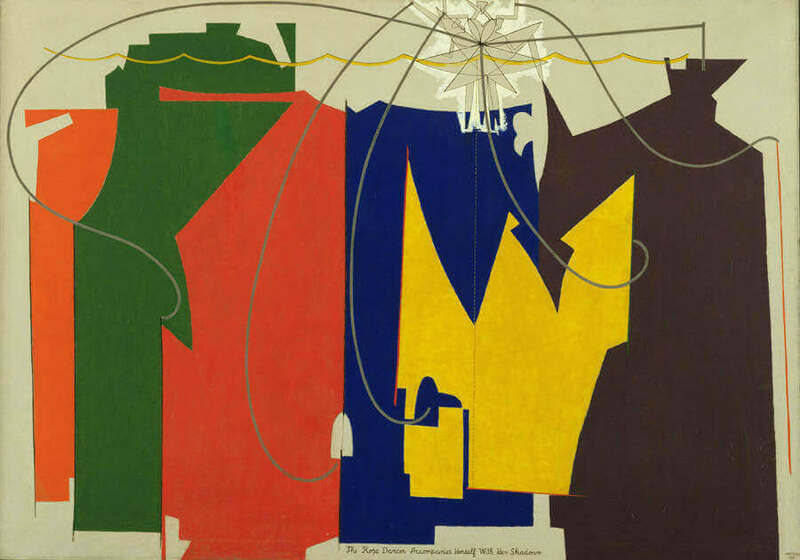 Inspired by a tightrope act he had seen in a vaudeville show, Man Ray cut pieces of colored paper into shapes corresponding to the dancer's acrobatic movements. Dissatisfied with his work, he noticed that the discarded scraps of paper on the floor formed an abstract pattern. Comparing the accidental pattern with shadows that a dancer might have cast, he incorporated it into his composition. The figure of the tightrope dancer, the acrobat, and the circus performer in general were often adopted by artists throughout the last century in representations of movement, gravity, and the body in space. In his autobiography, Man Ray revealed the technique employed in the design of this picture, which he began shortly after moving into his studio on Lexington Avenue later in 1915. Here the artist provides a step-by-step account of the procedure that was followed in the construction of this important painting: "The subject was a rope dancer I had seen in a vaudeville show. I began by making sketches of various positions of the acrobatic forms, each on a different sheet of spectrum-colored paper, with the idea of suggesting movement not only in the drawing but by a transition from one color to another. I cut these out and arranged the forms into sequence before I began the final painting. After several changes in my composition I was less and less satisfied. It looked too decorative and might have served as a curtain for the theater. Then my eyes turned to the pieces of colored paper that had fallen to the floor. They made an abstract pattern that might have been the shadows of the dancer or an architectural subject, according to the trend of one's imagination if he were looking for a representative motive. I played with these, then saw the painting as it should be carried out. Scrapping the original forms of the cancer, I set to work on the canvas, laying in large areas of pure color in the form of the spaces that had been left outside the original drawings of the dancer. No attempt was made to establish a color harmony; it was red against blue, purple against yellow, green versus orange, with an effect of maximum contrast. The color was laid on with precision, yet lavishly - in fact, the stock of colors was entirely depleted. When finished, I wrote the legend along the bottom of the canvas: The Rope Dancer Accompanies Herself with Her Shadow."